Freezing temperatures bring misery to roads, trains and airports as weather warnings remain in force. The A38 at Haldon Hill in Devon has been reopened by police. The road - which runs between Plymouth and Exeter - was closed following a crash involving several vehicles at about 16:30. Drivers were also stuck on the same section of the road on Thursday evening. A junior doctor talks about his journey to the Royal Devon and Exeter Hospital in the snow. Some people might find work to be a long hard slog, but with Storm Emma this week it's been that just to get to the building for this doctor. We've been hearing a lot of stories of difficult commutes to work, but Dr Steve Harris of Beacon Medical Group's journey has to be one of the toughest. 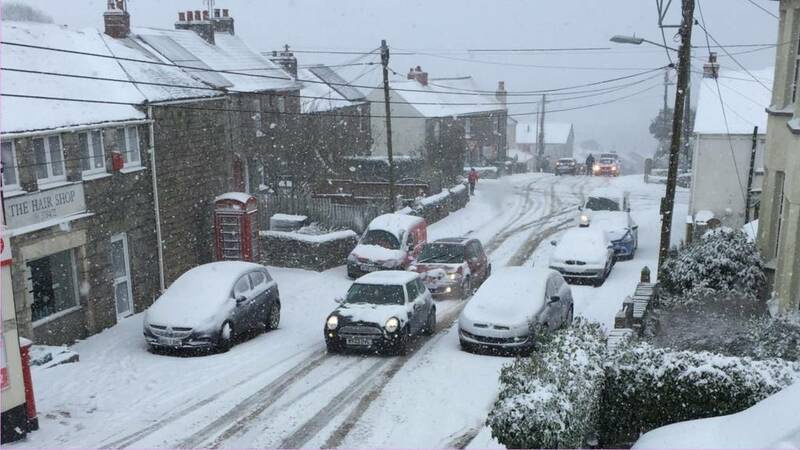 Rather than cave into the elements and let his patients down, he trudged for almost four miles from Cornwood to make it to the group's Ivybridge practice on time. Royal Devon and Exeter NHS Foundation Trust has appealed to nurses and other clinical staff to work over the weekend at its Wonford site. The trust said extra staff were needed to "boost numbers" allowing them to provide safe care to urgent and emergency patients. Staff unable to get to work are asked to contact the hospital, as well as those from "neighbouring hospitals" who live close by, to help out. "Our greatest need at this time is for registered nurses," a spokesman said. "If any other 4x4 drivers can help this weekend please contact the Exeter Transport Hub on 01392 403913 as soon as possible." This weekend's planned Michael McIntyre's shows at Plymouth Pavilions have all been postponed due to the severe weather. Thursday night's show was also postponed to 15 May. 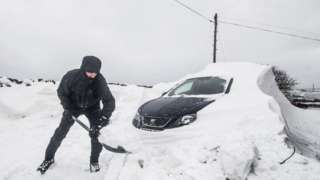 Police have been out searching through massive snowdrifts on a main road in Devon. Officers used poles to try and find any stranded vehicles on the A386 at Sourton Cross near Okehampton on the edge of Dartmoor. Police said they were satisfied nobody had been stuck in any of the cars discovered. The Environment Agency has upgraded several flood alerts across Devon and Cornwall to the more serious status of flood warning, meaning flooding is expected in the area. You can check the latest flood information here. At Tiverton Hospital fire crews have attacked the snow to clear a path. The death of a seven-year-old girl in Looe, east Cornwall has "reverberated around" the town. The girl, who has not been named, was playing in the snow when a car crashed into a house in Bodrigan Road in treacherous conditions, hitting the child as well. The car was removed from the scene on Friday. Investigations into the incident are ongoing. Armand Toms, Mayor of Looe, said: "This has reverberated around the community and it's actually brought the community together because they are going to support the family. "The family are well known. Everybody I've spoken to today is absolutely gutted that this has happened and the offers of help have poured in." Tiffany Coates, an adventure motorcylist from west Cornwall, swapped her bike for a snowboard. You can see her riding from the sand dunes covered in snow at Porthcurno to the sea front. About eight to 10 vehicles have been involved in an accident on the A38 south bound at Haldon Hill, with no injuries. Initial reports suggested about 40 vehicles were in the collision, but it is now understood this is the number of vehicles needing to be cleared because of the crash. The south bound section of the road is currently closed. Highways England said another, minor, collision had happened on the road heading northbound, closing one lane. A spokesman said the incident is believed to be relating to black ice on the road, and it was "difficult to say how long" the road would be affected. Last night drivers on the same section of road were stuck for hours in icy conditions. Drivers have been advised to avoid the route. There has been flooding in west Cornwall because of melting snow and this morning's high tides. Branches, rubble and other debris blocked roads and pathways. The scene has been described as "utter devastation" by residents as the cleanup operation continues. The footbridge at the top of the village in Helford has completely washed away. Melting snow and high tides have flooded the storm grill at Porthallow. A Cormac spokesman said council teams were working with the Environment Agency and local residents to clear the grill. About 40 vehicles have been involved in a 'pile up' on the A38 at Haldon Hill according to police. Cars have skidded and become stranded due to black ice. The westbound carriageway has been closed from the A379 onwards. On Thursday hundreds of motorists were stranded for hours on the same stretch of road. Carers from an agency in Devon have been attending clients on foot or by 4x4 where roads are impassable. Bay Care - which provides end of life and home care to 250 clients across Torbay, south and west Devon - says it is prioritising those deemed to be "high risk". Katrina Green, director of Bay Care, said local volunteers transporting staff with 4x4 vehicles had been "incredible". She added staff had also been making journeys on foot. "We had a member of the care team walk three hours yesterday for a single visit to a lady at high risk, and we’ve care workers today on foot, while roads are still impassable," Ms Green said. “Today, I’m expecting three hours of care contact with the client to take about 10 hours of care worker’s time," she added. The agency, along with Unicare Devon, is appealing for further 4x4 volunteers to come forward in the Torbay, south or west Devon area. A gritter with a snow plough has been found overturned on the A379 between Shaldon and Torquay.